The CURLS company prides itself on offering high-quality yet affordable products targeting the natural hair market. One of the newest collections from the brand is the Blueberry Bliss line. I was fortunate enough to be able to try it out and review the Twist-N-Shout Cream. If you already know how popular blueberries are as a superfruit, it's no surprise to find these berries incorporated into hair products now. Not only do blueberries fit perfectly into a healthy eating plan, but their antioxidant properties contain benefits for your hair as well, including helping to reduce frizz and breakage. The Twist-N-Shout Cream is very thick and custard-like, with a slightly fruity scent, but nothing overwhelming. Because the product is so thick, a little goes a long way. Disclosure: Review samples were provided by the manufacturer. For more information, please see our Ethics Policy. Following the instructions on the generously-sized jar, I applied the cream section by section on freshly washed and conditioned, wet hair, over my Shea Moisture Jamaican Black Castor Oil Strengthen, Grow & Restore Leave-in Conditioner. (I also tried the product out on dry hair and discovered that wet hair gave me the best results.) My hair wasn't dripping wet, but I only blotted the ends with an old tee shirt. As I applied it on each section, I two-strand twisted it, adding a perm rod to the ends of a few twists together. The perm rod step is optional, but since my hair was wet and unravels easily in that state, the rods helped my ends remain twisted. 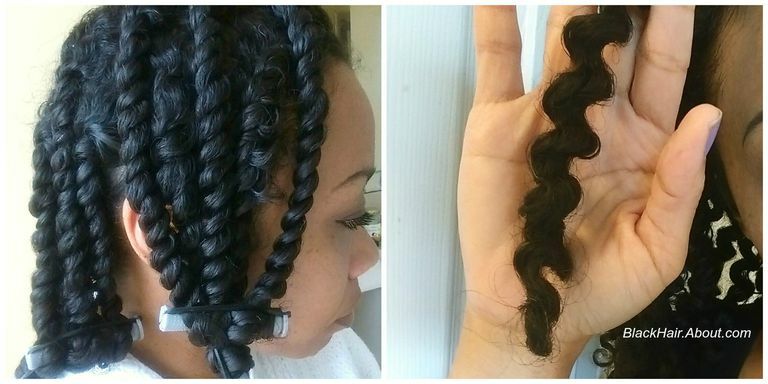 The left photo is after twisting my entire head; I ended up with 15 medium-size twists. I sat under a bonnet dryer on medium heat for half an hour, then let my hair continue drying overnight. I removed the twists the following day. The right photo is one of the twist sections right after unraveling it. It's completely dry, and you can see the definition. This is my twist-out result, after carefully pulling apart each twist for volume, then picking out the roots for additional fullness. My hair was extremely lightweight, touchable, and bouncy, with great definition, and no flaking from the product. I spent some time outside in the humidity to see how my hair would hold up, and I ended up with virtually no frizz. At night, I put my hair in a pineapple and the next day, my hair looked almost the same as on day one. I only wore my twist-out for three days until I shampooed again, but it held up well. This is a great product choice for naturals and transitioners alike. You get a soft hold with no tacky buildup. Although it's called Twist-N-Shout Cream, it's designed for twists, braids, and locks, too. Even though I used this product for a twist-out, it's wonderful for two-strand twists by themselves as well. The next time I plan on creating a twist style to wear for a few days, I'm reaching for this cream. The only drawback I can think of is due to such good curl definition, I had quite a bit of shrinkage, which usually comes with the territory of well-defined texture, so if shrinkage is a major concern for you, keep that in mind. Which Is Better for Two Strand Twists, Wet or Dry Hair? DevaCurl Product Review with Pictures! 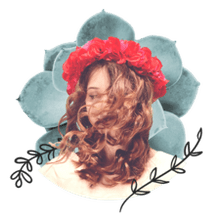 Want More Definition In Your Type 4 Hair? Which Starter Loc Style Works for You?